Yay! It’s about time you see this coat in person! I went on and on about it during the winter packing series, and today you get to see it in real life. You might remember, earlier this winter, I set out to find a great winter coat — a warm, versatile coat that could last for years. Before we jump into why I ended up choosing this particular coat, let’s take a look at two of my past mistakes with winter coats. 01 | In 2014, I added a grey wrap coat to my winter capsule. Back then, I didn’t understand fabric composition — I just thought that it looked warm, so it must be warm. Ah, 2014 Caroline, you have much to learn. It turned out, the coat was made of a thin polyester blend and it wasn’t warm enough for freezing temperatures. Lesson learned? Pay attention to the fabric composition. Look for a coat that’s made primarily of wool. 02 | Also in 2014 (the year of coat mistakes), I added an oversized faux shearling jacket to my capsule. It was a textbook example of sacrificing quality to hop on a trend, and it did not go well. The coat was poor quality and it had the sharpest zipper pockets — meaning I’d scrape up my hands each time I reached inside. Not cool. Lesson learned? Invest in high quality, classic pieces, especially when it comes to something as foundational as a coat. Pay attention to the details and the experience of wearing it. And … think twice before hopping on a trend. While I’m tying them up with a pretty little “Lesson Learned” bow, these mistakes were incredibly frustrating. I try to be as mindful and intentional with my purchases as possible. So I absolutely hate making purchase mistakes, especially after I’ve shown it on the blog. But the truth is, we’re all here to learn and evolve — myself included — and, owning our mistakes is the first step towards growth. The good news? I’m finding that, while I still make purchase mistakes, they happen less and less these days. It’s classic. I’ve always loved the idea of a traditional camel coat, but I love the minimal take this one — simple clean lines and no hardware. The color also feels updated, like a new take on the classic camel color. It’s rich, yet still neutral. The experience of wearing it is positive. It’s sleek and not bulky. It’s soft. The collar stands up for extra wind protection. And the pockets are well placed and easy to use. It’s got excellent fabric composition and it’s warm. It’s 70% wool, 5% cashmere, and 25% nylon. So that’s that, and now it’s your turn! Let’s swap our lessons. 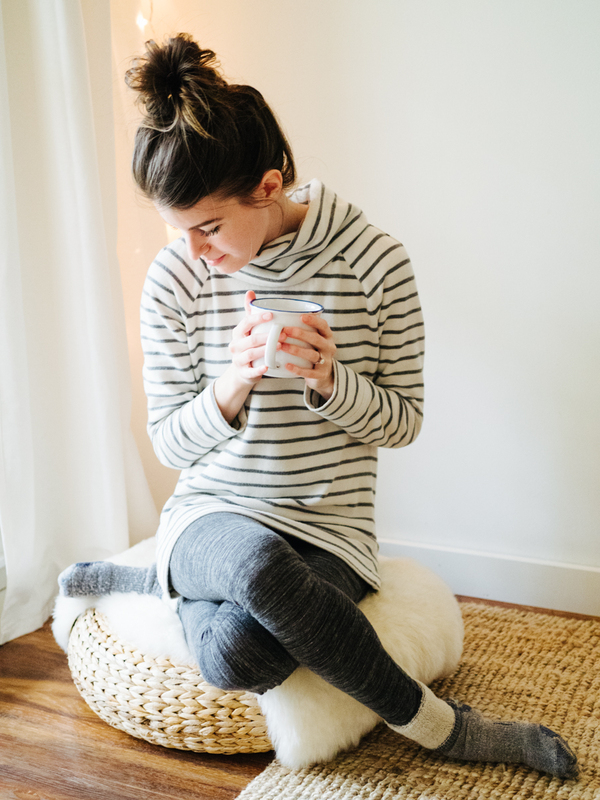 Tell me something you’ve learned from a purchase mistake lately — clothing or otherwise. My coat mistake: understand how cold your cold is. Several years ago I saw a beautiful wool coat. Gray, classic cut, comfortable. On the rack that said “winter coats” and it was wool. I bought it. I loved it. Deep winter came to my home in New England and I froze. Lesson learned: a single layer of thin wool is not enough for single digit temperatures. Next coat purchase: Wool coat #2, classic cut, comfortable, purchased from L.L. Bean (who understand New England winters), THINSULATE LINED. That coat keeps me warm no matter what the temperature. And if it’s warm (read: upper 30’s), I just leave it unbuttoned. I agree that a wool coat is not warm enough for northern climates. I personally think that a down puffer coat (to at least the knees, and with a hood) is the best way to stay warm when it is really cold and windy. I think this coat is a very good investment and I agree, quality is for a winter coat essential! Love the combination. I remember that shearling jacket, I thought it was so cute! Sorry it didn’t work out for you. I agree that a classic coat is the way to go! A good coat costs good money and should last a good many years. As for purchase regrets, I have a pair of combat style lace up boots that I liked when the trend started a few years ago, bought, and have trouble wearing. They just don’t feel like me…. however I learned that I’m girlier than I give myself credit for, and now stick to more feminine style shoes. So, where would you suggest looking for someone who is allergic to wool?? I’ll be honest, I tend to avoid coats like the plague anyway and just layer a couple sweaters on and call it a day. But, I’d love to have a nice versatile coat that I can wear with a dress or with jeans like the one you’re wearing. My problem is that all the high quality ones are made with high quality material and I spend the whole day itching. I live in Virginia so the need for a really warm jacket is not huge (I’ve been known to wear flip flops in January) but it frustrates me at least once a week all winter long! Vaute Couture!! 100% vegan, so no wool. I’ve been wearing the Aidan from them all winter in Minnesota. You have to layer under it just like with any coat but the quality is impeccable AND machine washable. YES!! Yes! Agree, love the brand and just bought the Casto in Stargate. The blue color makes it unique (and gold hardware!) plus it’s super warm for NY winters. Hi Jamie, I too am allergic to wool and know how frustrating it can be when shopping for coats (and basically everything for fall & winter). I have found that I can wear wool under the right conditions: I absolutely must have a base layer (exposed skin + wool = hives), and the wool must be very high quality, like cashmere, merino or a blend. I have a nice wool peacoat from Lands” End that works well for me. It’s old, back when they still used fine Italian wool instead of the cheaper blend they use now. Best wishes! I feel your itch, lol! I can’t wear a wool coat even if I wear proper layers underneath it so the wool is not actually touching my skin……I still end up itching and with a rash, generally around my neck, chest and wrists. But if I wear one any length of time, the rash spreads everywhere. No bueno! Fortunately, I live in South Louisiana so I’m rarely in need of a super warm coat for more than a few days out of the year. I went into a Goodwill a couple of years ago and stumbled over a below the knee swing coat in black (my preferred color) made of heavy brushed suede. It was a vintage piece and lined with some sort of an insulating fabric. Beautiful cut and style, toasty warm and roomy. Got home and added a vintage black leather tie belt and it was perfect! So was the price……$15. I seriously doubt that I’ll ever need to look for another heavy winter coat. I’m 57 and if I wear it on average seven days out of a year and I live another 30 years…..Lol! That’s still under two years of wear! I have a friend in a similar situation and I hit a brick wall in attempting to suggest something for her! I’ll study this comment thread for all the recommendations! I love the delicate little necklaces you’re wearing. Can you share where they’re from? Sometimes it takes a few fashion mishaps to learn what we really want to get out of our purchases! A high quality camel coat is a great investment IMO, because it’s neutral, classic, and will last for years to come. a long aubergine velvet coat that is strangely versatile, as it’s quite warm, quite waterproof and can be dressed up or down, easily. A good winter coat is definitely an investment, but hopefully one you can wear for years. My parka has a lifetime guarantee, which helped me decide. I’m in the UK, so it may not be applicable, but my parka is from Craghoppers, a few years back. They have a fabric called aqua dry that looks like canvas, but is totally waterproof. I have worn it in an hour’s downpour and was completely dry. It is not as warm as my down-filled coat, but is padded, so perfect for cold, wet days here. I hope that helps. Here are my considerable rules about coats – I’ve always lived in an area that had at least 2 weeks/year below 0. I like to have two winter coats – casual and dress. That way it’s easier to keep things clean. 1. Generally a puffer jacket. 2. Hits below the waist to keep you much warmer. 3. Some kind of cinching around the waist to keep the updrafts at bay. 4. Zips up to my chin – the cold on my chest and neck make me cold all over. 5. The zipper has a flap over it to keep the wind from going through the zipper. 7. Outside pockets large enough to hold mittens on one side and a hat on the other. 8. A hood to be used in addition to the hat. 9. Roomy enough to wear a thick scarf underneath the coat. 1. Wool, preferably lined with Thinsulate, too. 2. Knee length or longer because I might be wearing it with a dress. 3. The front overlaps considerably to keep the wind going through (think double-breasted. 4. The front has the option to button up to at least the bottom of the neck. If it doesn’t go up to the chin, I might wear two scarves – one under the coat, one over the coat. 5. Pockets big enough for dressy gloves and a nicer winter hat. Your casual coat rules are so spot-on. I’m a lifelong Michigander and ~10 years ago my mom bought me a winter coat as I went into college. It was a high quality coat but I learned my lesson about letting someone buy you a staple piece who has a completely different daily lifestyle as you. Functionally it was not great. I was finally in dire need of a new coat last fall and my list of requirements looked exactly like yours. I also specifically sought out a drawstring hood, too. My last coat did not have that, and while it’s not “fashionable” to draw a hood close to your face it’s sometimes necessary up here or else your hood blows right off your head in a strong wind! Just thought I’d add that detail on to anyone considering a heavy winter coat reading this. Thanks! My mother grew up in Upper Michigan, and I’ve lived in Alaska, the mountains of Washington State, Minnesota, and Wisconsin. Some of the things on my lists were passed down from my mother, and some I came up with myself. My coat/cost failure is arm length. Most coats never fit. I’m 5’10 and my arms go on for miles so when I do find a coat that works and fits past my wrists I always buy whether it’s a good or bad purchase. At least there have only been 3 of those purchases but I wish I didn’t make 2 of them. Love the blog ❤️ Always very inspiring ! I can totally relate to coat buying mistakes! My senior year of college I bought a dressy ivory coat at a J Crew warehouse sale. 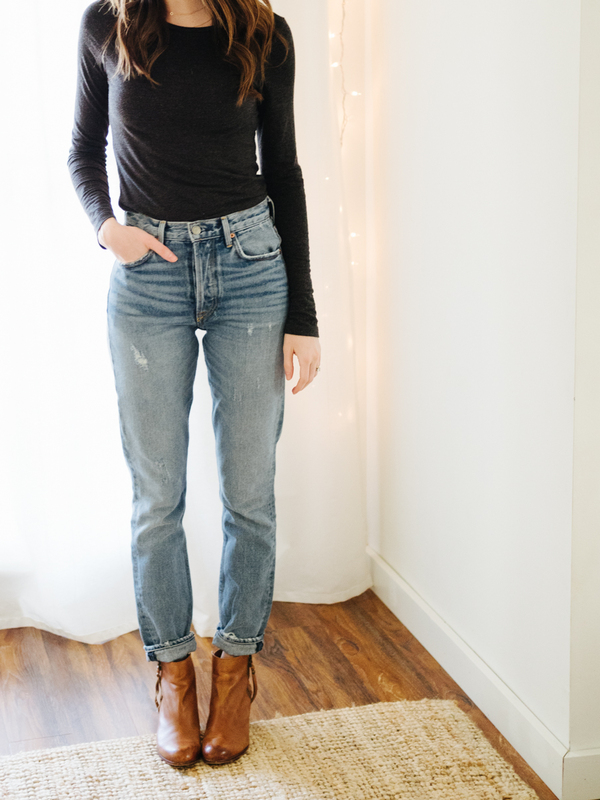 I was a FL girl moving to NC, and it seemed like a deal I couldn’t pass up…but I’ve honestly only worn it a handful of times in the last 10 (!!) years. It’s too snug in my shoulders so I feel kind of trapped in it, and it just feels more formal than my life is 95% of the time…so I opt for my puffy down coat even when it’s too casual. I think your post helped me give myself permission to replace it with something wearable! I really appreciate you sharing your journey and thought process! You felt me yesterday with that spring shopping fever altough in Bucharest (RO) is still the middle of the winter with temperatures under 30 degrees. On Saturday, I went to check the sales in the stores and guess with what I returned home? A sweater and some grey leather low heel boots. Classics. And they were reduced a lot so I did not spend the amount I was preparing myself at home for. So this is what I call a smart shopping experience. 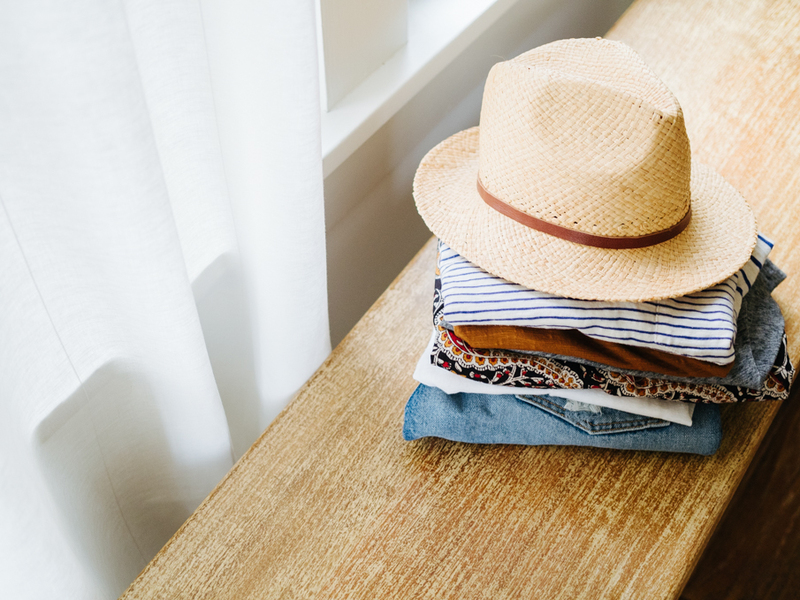 Where you buy the minimum amount of useful and quality stuff on a low price and you return home happy and ready to re-style your wardrobe with those new items, a feeling that you will have for a long time everyday you open your closet. But that was the lucky experience…which reminded me it was so rare a couple of years ago. I have learned my lessons in the past years and still learning now and then in the present. But you know what happens? Now you look on two years ago and you are proud and without regrets. Proud of what you learned and become during the past years. Without regrets because you did what you felt back then and that thing made you happy and ready to go on and discover who you are. This mistakes and what we learn makes us who we are. Makes us proud that we can take more good decisions than bad ones and that we have the option to share it and make others learn from our experiences. When I think about me in 2014, I smile. It was the year I said I have enough clothes and I have to stop with this buying fever that makes me unhappy in the end anyway. So I have donated a lots of old clothes, not my stle clothes and so on. I was happy and free to prioritize what meant more for me. It was a revolutionary year of my own style and prioritiesin life. On all plans. So yeah… I made a lots of mistakes back then, but I am so proud of them right now! 2. Sleeve length: Another Note to Self–go longer When you put out arms in front of you, they should still hit good place; when arms at side, probably down at least to knuckles. Not making purchasing mistakes has been a hard lesson for me to learn. I totally bought into “must have” lists a few years ago when I started seeing them all over Pinterest. I’m still recovering from the fallout (for example, I am currently selling a pair or $300 patent leather pumps that were purchased because someone labeled them a “smart investment piece” and which I never wear). I’m trying to define “investment” pieces for myself now and really appreciate that you encourage people to buy/wear what works for them. Quick question- if you were to buy this coat in another color, what would it be? I really like it on you, but I just don’t feel pretty in camel because of my hair color. As always, thanks for sharing! I love Aritzia so much! Do you know much about their practices and if their stuff is made responsibly? I couldn’t find info on the internet. Thank you! Hi Cara! Great question… Project Just is a resource to check out brands. Aritzia has pros and cons, but in my opinion it does sound like they’re making efforts to be more sustainable: http://bit.ly/2kMBL8C :) Hope that helps. I LOVE this coat, and that you shared your previous mistakes. Living in Colorado I know how hard it is to find a cute, good quality, and warm coat without falling victim to trends. I love your pick and how thoughtful you were about it. Oh so many mistakes–where to start? The skirts that are too short because I didn’t try SITTING DOWN in the dressing room. They look great when I’m standing, and embarrassing when I sit. Ugh. Numerous pants that fit neat and tidy when I first put them on, and then stretch out sloppy by the third hour. (I haven’t yet learned how to tell in advance which will and which won’t.) Cute boho tops that are completely impractical for my rural lifestyle with a toddler. The most recent and most prevalent, however, comes with online purchases. Although I’ve carefully calibrated my monitor, I’ve discovered that most clothing pictures online show up more cool (blueish) than they are in real life. I love cool colors, but warm ones make me look ill. So, over and over, I’ve bought things that I thought were great colors, only to discover they look awful on me. Now I save the picture to my computer, open it, and then edit the warmth (about +30 on my software) so that I can tell what color it really is. It’s a huge pain, but it’s better than the buying-and-returning hassle. More than 2% elastic/lycra will cause jeans to sag or not stay snug. A bit of stretch is good, but too much causes the aforementioned issue. Look at the label next time you’re on the market for pants. The best balance of stretch and holding shape I’ve found are the Wrangler Q baby jeans. I hope that helps! Try a canvas coat that has plenty of insulation (thinsulate). Some of them come with a removable lining and can be also used as a spring/fall jacket without the insulation. I’m done with cheap rubbish coats and have been slowly building a collection of appropriate warm coats. First a long down puffa jacket for the super cold snow days. Not worn so much this year as not been that cold but when I need it I need it! Then a pure wool duffle coat – tom boyish, cosy and a British classic. I feel like Paddington Bear. This year a wool camel wrap coat – elegant and dressier than the others. Warmer than I thought as it has a quilted lining and the big shawl collar keeps me toasty. All spotted at the start of each season and snapped up as soon as they went on sale. Great coat, Caroline! 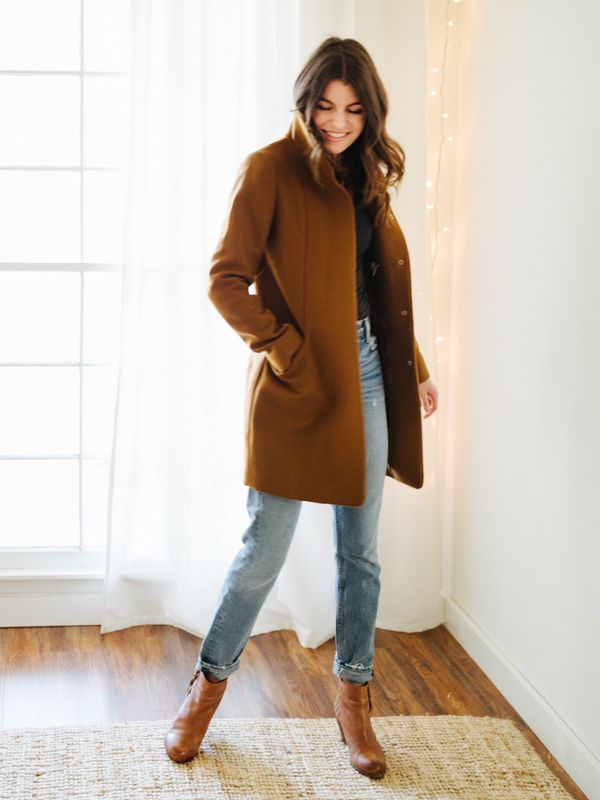 If I am following correctly, it is the same coat that Lee from StyleBEE has and wore during the 10 x 10 Challenge and it looks great both of the ways you ladies are styling it. My favorite coat is a camel coat I got from the “swap shop” at the local dump. We have a little shed where people leave redeemable and free items at our trash/recycling centers, and I happened upon it at the right time. 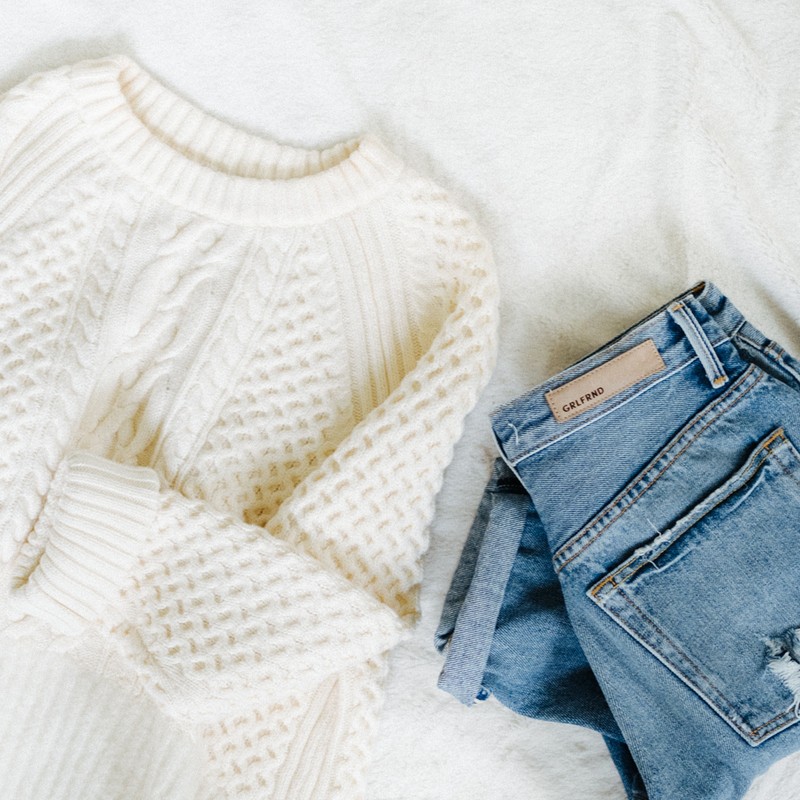 Wool, lined, and a perfect camel tone. I love those little happenstances. For example, I just got the perfect pair of black skinnies from a clothing swap, too. Man, I love it when the universe passes along great stuff. Plus, I am on a year-long self-imposed shopping ban, but still accepting swaps/trades, so it felt like a nice little reward for NOT shopping. 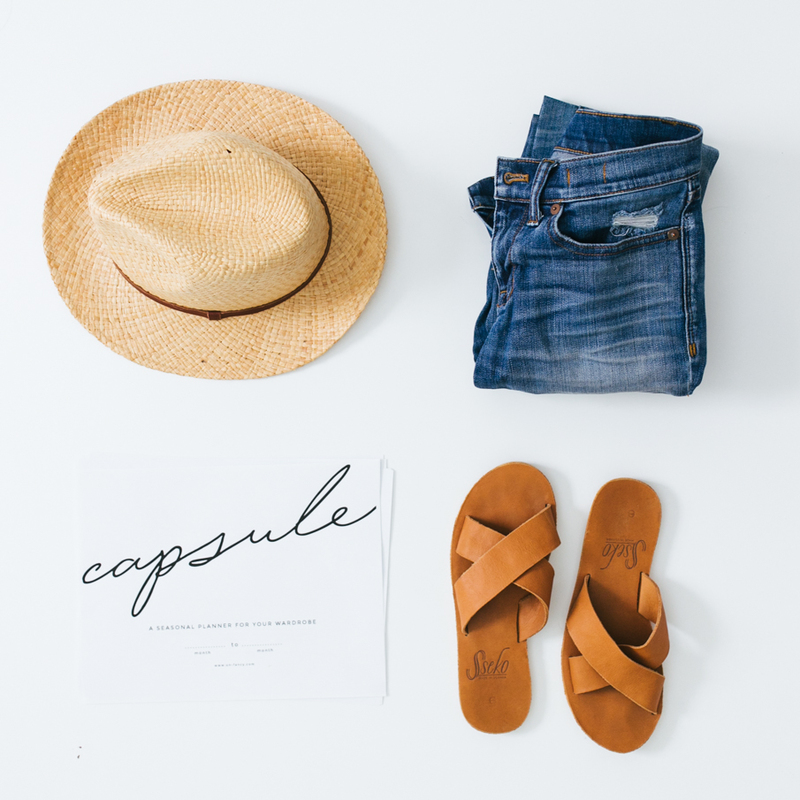 Would you ever consider hosting an online clothing swap or showcasing one of yours with some friends? 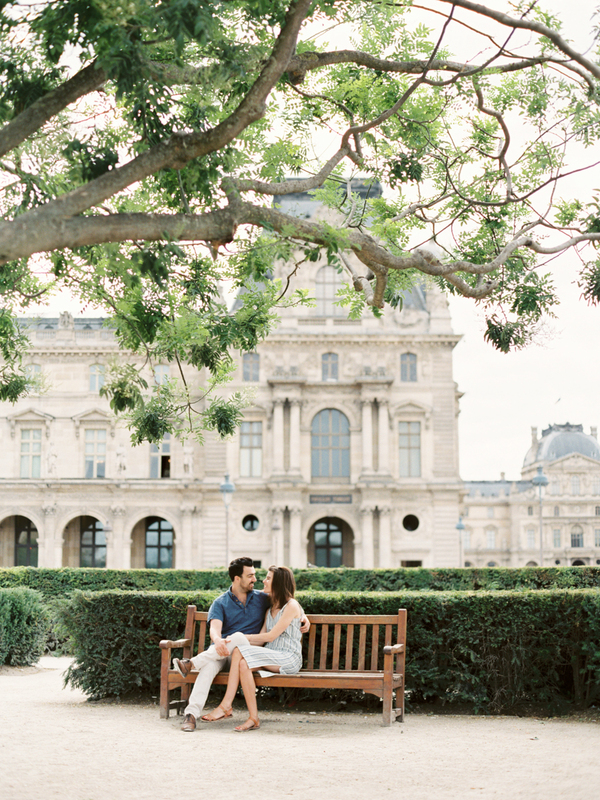 I don’t know how that would coincide with your current plans, but it would be a fun one to see in pictures on the blog! Thanks! Thankfully I had kept the tag and receipt so returning it was easy. I then found the perfect dark camel coat at French Connection that snaps closed, is the perfect length in all the right place, has interesting lapels, and cinches in at the waist so I don’t look like a massive rectangle! :D And this is now a lesson in fit I plan to apply to other future purchases like jackets and vests even. Love that coat :) I actually nearly bought the same one this past fall. I ended up getting the shorter, belted version of the coat in black instead. The biggest lesson I learned recently is that if your gut tells you something isn’t going to last… it isn’t going to last. I picked up a couple sweaters in November, and they’re both pilling already in a brutal way. I knew when I was looking at them that they were kinda flimsy, but I convinced myself that they would be okay. Big mistake. I always wanted a vintage black cashmere coat, so when I scored a fantastic deal at a consignment shop, I was thrilled! I live in Houston, Texas. Guess how many times I’ve worn my beautiful coat…..Twice! My coat lesson: There’s no such thing as Winter in Houston. I can get by with a trench coat & scarf. Although I love that style of coats, my dilemma is finding one that is 4ft 11 inches and broad shoulders friendly . :( anyone have any brands they would recommend ? Thank you in advance ! Hey Mari, sorry I don’t have any brands to recommend, but I feel like Nordstrom has a lot of petite options? I’m sure you’ve looked everywhere — that can be frustrating! What about J. Crew? I’m not sure about the shoulder issue, but they carry a decent line of petites and their coats are usually well-made. Nau is a fantastic company for very functional (read: real snow and cold temps) but stylish coats, and they are a great environmentally conscious company. I have been eyeing this coat! That color is luscious. If it’s not too personal, would you mind telling me your measurements? I am having a hard time figuring out what size to get. I am shorter than you, but I suspect you are more slender than I am. And how are the arms? Loose or tight? Lately, I feel like very one must have stick arms, because mine do not fit many RTW tops and coats! Apparently, I have guns. The trouble I have with coats is the fit. I’m 5’2″, have narrow shoulders and a larger chest, so my current coat looks just a bit oversized on my body. Couple that with the fact that I’m in the south and don’t need a heavy duty coat very often, but still want to stay warm on those random days when the weather goes crazy. Any recommendations for us petite girls? Hey Taryn, I don’t have any specific brands to recommend, but I feel like Nordstrom always has good Petite options? Sorry I can’t be more help, that can be frustrating! Thank you for modeling “taking time to choose”! You have been demonstrating this in your posts. Grateful for that life changing and real lesson! Results are peace, really enjoying the pieces of clothing( they spark joy!). Therefore, I am hearing from you: “Whatever the piece, use your own authentic criteria.” Thank you for the guidelines you provide. Over the years, I have relied way too much on trends, even though I know my style, age, lifestyle activities. Question: what impact has this intentionally choosing/planning had on your everyday schedule— setting priorities— enjoying life more(?)…? I actually own this coat (in grey, bought two years ago), and for me this was a …. purchasing mistake (sorry to be a buzzkill). The fabric of my coat pilled horribly along the seams of the sleeves, the collar no longer stands up (and when it did, my foundation would rub off on it), the back of it always wrinkled from sitting down, and the light grey colour was easy to stain. So I wish you pill-less sleeves, an ever-upright collar, and a smooth backside (for your coat anyway). I think the camel colour was definitely the right choice–if I bought it in that colour, I’d have fewer complaints. Purchase mistakes, I’ve had a few! – The leather jacket I bought with my boyfriend in tow. Neither of us realised in the shop that I bought the girl’s version of his. We now have to coordinate our jackets so as not to wear them at the same time. No one wants to look like Posh & Becks circa 1999. – Over-the-knee boots. I saved and requested bday money and used quidco (a cashback site) for a pair of VERY expensive, iconic OTK boots (you probably know the ones). I bought them online and tried them on only to realise that style doesn’t suit me at all. Why do they look so good on everyone else?! No fair. At least I could send them back. I bought some ankle boots at almost 1/3 the price. – Dresses that are dry clean only. I’ve finally learnt my lesson but to have to KEEP PAYING for your clothes AFTER you buy them?! Ouch! Jackets and coats I’m fine with dry cleaning but trousers, tops and dresses? Nope. I have financial goals and a huge dry cleaning bill won’t help me get there. And these are but a few. You live and learn. I think if the internet had existed when I was growing up I’d have been so much more stylish but I’m so glad it didn’t exist because can you IMAGINE living your teenage years on social media? No thanks! You’re not supposed to wash cashmere in the washing machine, that’s probably why, haha! Oh no, you totally can. I do it all the time! Only the J Crew has shrunk. Cold wool cycle, works fine :-). I have this coat in black and love the look and fit of it. However, I’ve realized buying it in black was a huge mistake! The black wool picks up and shows every little piece of lint, hair, fluff so I have to lint roll it every time I wear it and still feel sloppy. I would highly recommend choosing a dark or light gray for a wool coat. Especially with this style, it still looks dressy while looking much cleaner at the same time! I feel like if I get this coat I’ll just be a straight-up copycat. 😂 but it’s so lovely! I have the same exact coat! Fabulous choice and it looks lovely on you. Purchasing mistakes are indeed frustrating. I have had my share, but they are getting less frequent as I become for mindful and stick to the less is more/ quality over quantity approach. White jeans and leather leggings have been my repeated purchase mistakes. Not once, but twice with each. YIKES. 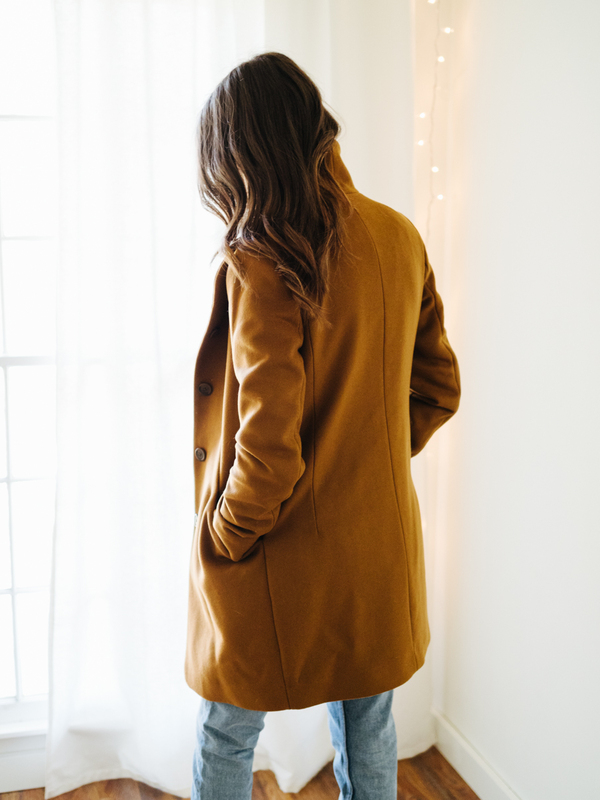 Love your coat, and love all of the great advice that everyone is contributing to this post. Being Canadian, I feel like I’ve got some expert advice to lend myself. First, if you live in a true winter climate, you need more than 1 coat. I’ve got a temperature range system that helps me to decide what to wear. If it’s colder than -10c, a parka is the only option. Waterproof, windproof, down/synthetic, drawstring hood and waist, machine washable, close fitting to body, ample pocket space for mittens and hat, and knee length. Mine is navy. For temps ranging from -10c to 8c I wear an alpaca jacket (its warmer than most wool jackets I’ve tried). 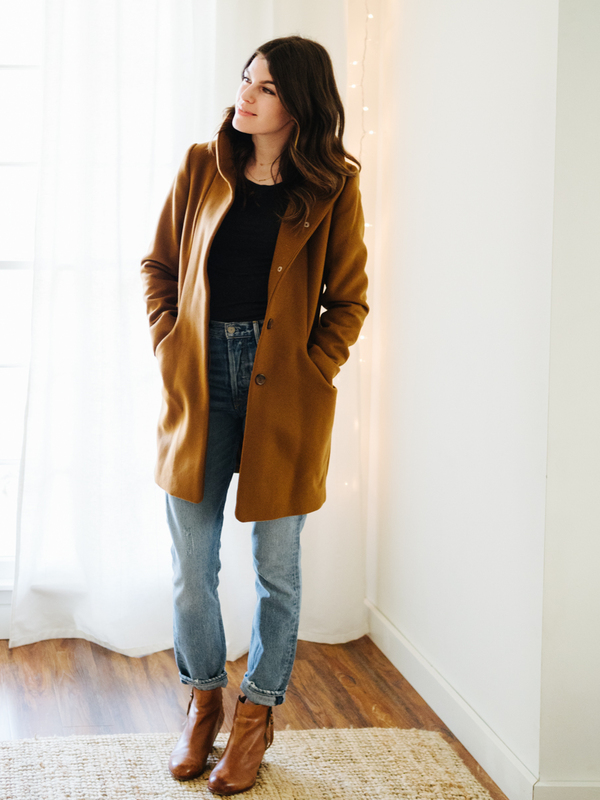 This coat looks great for work or casual and looks a lot like the Aritzia option. Mine is forest green. Rules for this category include: natural fibre, lightweight, minimal hardware, belt optional, ample pockets for gloves and hat, knee length. Finally, for the milder days of 8c to 12c I have a wool wrap jacket that belts with a shawl collar (light grey) and a lightweight Canada Goose puffer (black). The puffer doubles as a base layer when it’s really cold but I still want to wear my alpaca coat – I wear both and am as happy as a clam. I also wear it outside to exercise when the temps are still on the cold side and it keeps me toasty. I don’t buy black or dark grey coats – winter is already too dreary, so I prefer dark neutrals instead. Thanks Jessa! This is really great advice. I’m all about wool/cashmere mix coats! A warm raincoat is also a need in London though and I really need to pick up a new down-filled coat for those really icy days. There’s only so many cashmere jumpers a girl can layer under her coat! I just bought the Wilfred Appel Coat in XS in cigar color after seeing this post. It’s pretty much a replica of this coat just a few inches shorter with a removable belt. But after seeing that you ordered an XXS I’m concerned my coat will be way too big. Hopefully it works out and I don’t have to return it. It was a steal at $99! I bought some linen shorts for summer here in Australia. While they looked great in store and felt super comfortable, I forgot how easily linen creases. I bough these shorts specifically for casual lunches were I want to feel a little dressed up without wearing a dress or skirt. They get so creased just on a short car ride so I think they’re going to have to be retired. Next time I buy shorts like this I’ll definitely sit down and move around a bit to see if they crease easily or not. The thought of ironing my current shorts makes me dread getting them out of my wardrobe at all! Ah! I’ve made a few bad blunders when it has come to buying coats. Not cheap ones either :( One of my worst was actually a winter jacket, a nice one, that looked AMAZING on, not bulky or ugly.I was won over by the fur collar, it looked so nice and warm. The price of the jacket made me think that it was worth it. I mean, a jacket that expensive must be good right? Wrong. I found out quickly that the jacket failed in the weather elements, where I needed it to perform best. Water seeped in and I ended up with wet arms during a downpour. Then when the temperature dropped, I froze. That fur collar? the jacket ending up in the dryer after a wet day and the collar wrecked. Complete fail. Next time around jacket shopping, I went with a list of things that I wanted. I paid almost 1/2 the price for a jacket on sale. It looks great, but most importantly, it is waterproof and warm. Good for the weather elements here on the west coast. This jacket has nice fur collar as well, but its removable so I can dry the jacket off if I’d like. Goes to show you that prices do not always reflect quality – do your research! Great post! Quick question: what are some of your favorite quality jean brands that are made in the US and under $150? Does this exist? Thanks! There are a couple that it looks like it could be. Whichever on you got looks beautiful! © Copyright 2019. Un-Fancy. All Rights Reserved. Design by love riot.